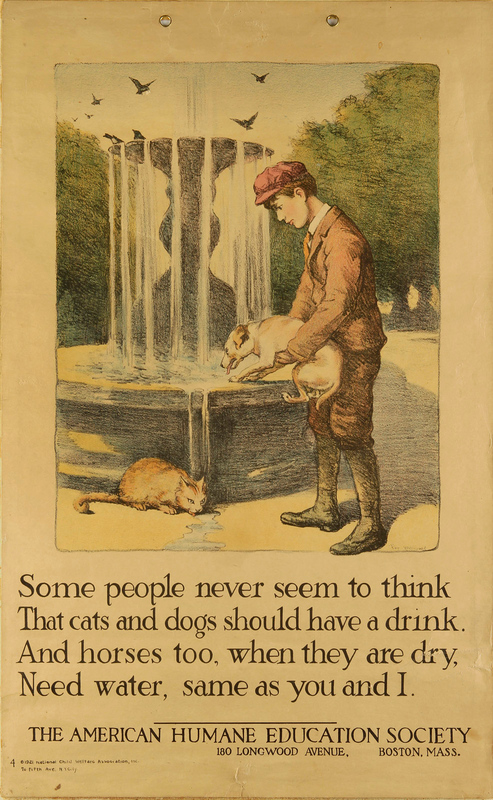 In the summer of 1921 the American Humane Education Society began selling a set of six colour lithograph prints received from the New York-based National Child Welfare Association. The protection of children and animals was often linked in the time period explored by this exhibition, so this collaboration was very much a part of the broader culture of Humane Education during this era. 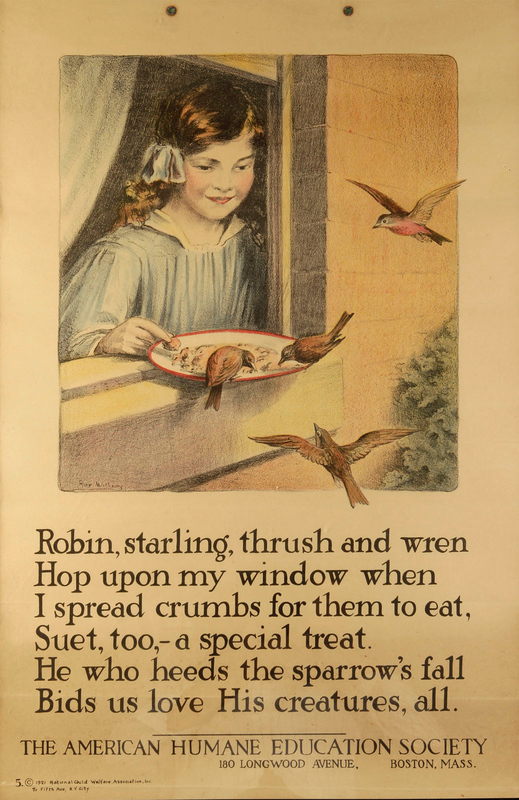 “Feeding the Birds” poster published by the American Humane Education Society featuring image and text provided by the National Association for Child Welfare. c.1921. Collection of Robert Penney. The image above is from this series and is entitled “Feeding the Birds.” This example is typical of the rest of the series in that the image and text work together to teach lessons of kindness and compassion. Below are 2 more images from this series. 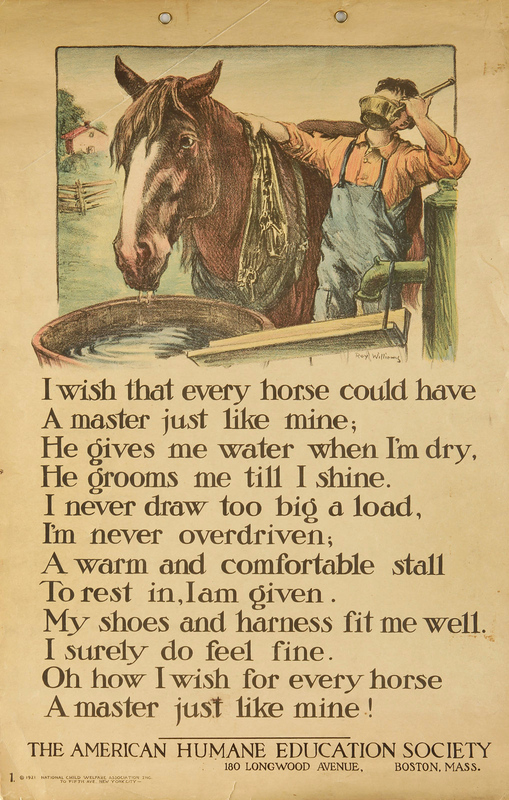 Poster published by the American Humane Education Society featuring image and text provided by the National Association for Child Welfare. c.1921. Collection of Robert Penney. The lithographs were hand-colored and measured 17 x 28 inches. Each print came with pre-made holes at the top so that they could be hung with a cord or string–these were prints that were meant to be displayed, and that process of display was built right in to the design. The July 1921 issue of Our Dumb Animals promoted these prints “for teachers, Sunday-school workers, Bands of Mercy, and all others who are interested in the welfare of animals and in the “culture of the heart” of children.” The cost of the series was $3.15.